Tree Top Adventure is inviting you all to visit the the TTA Booth at Glorietta Activity Center on April 23 to 26, 2015.
forwards, you would also be ziplining backwards. Silver Surfer is a 60 degree diagonal motorized zipline in which you’ll be standing on a specialized platform and you’ll be gliding up and down for three cycles. Expect that there would be stops and swings for every cycle. For Php 300.00 and Php 200.00 respectively, you could experience what superheroes feel as they fly and glide through the air. 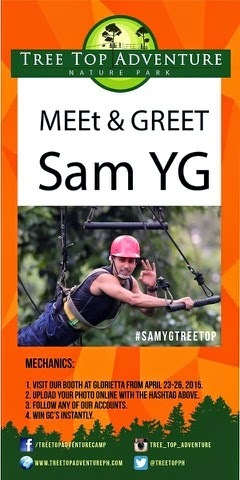 @TreeTopPH (Twitter) and @tree_top_adventure (Instagram).